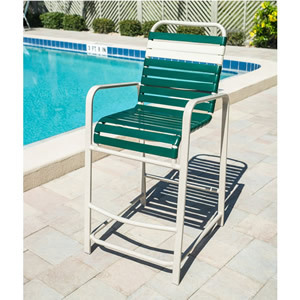 The R75 Flat Arm Strap Patio Bar Chair is a premium outdoor bar chair from our commercial pool furniture line. Featuring a powder-coated aluminum frame with flat armrests for added comfort and style and double-wrapped 2-in vinyl straps, the R75 Flat Arm Strap Patio Bar Chair is durable and stylish. Customize it today in any frame/strap color combination.